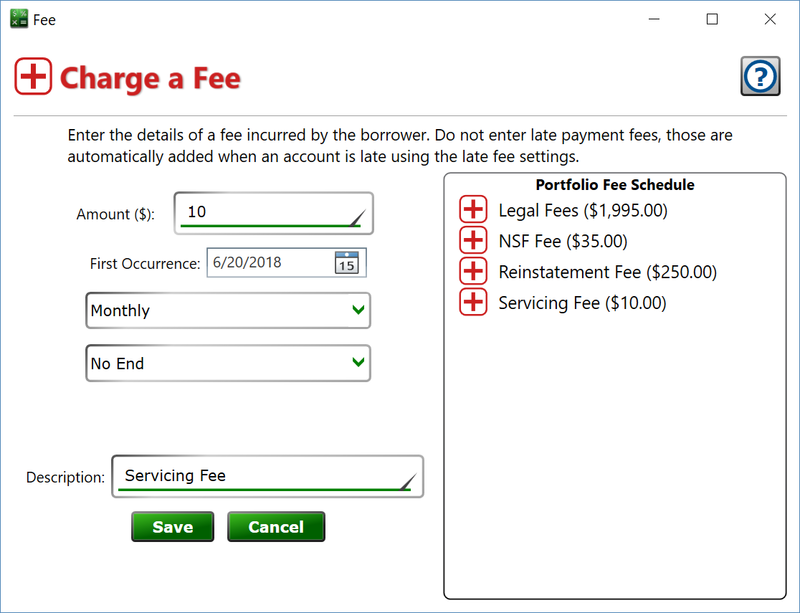 To get to this window, select a loan in the list of loans, go to the Settings tab on the right and either click the New (plus) button in the Other Fees section, or select a fee from the list and click the Edit (pencil) button. This is how you add a fee to a loan. Don’t use this to add late fees to a loan, instead use Moneylender’s late fee settings which can also be found on the Settings tab of the Loan Details panel. Portfolio Fee Schedule – this box will list all the fees configured on the Portfolio Settings dialog, Fees tab. Click a fee from the list to set the Amount and Description boxes to match the fee clicked. Amount – enter the amount of the fee to charge. First Occurrence – enter the date the fee will be added to the loan. Schedule Type drop-down – If this is a one-time fee, choose the Once option. If you would like this fee to recur, choose the frequency of the fee’s recurrence. If the fee should recur indefinitely, you can select No End, otherwise set the number of fees you want to schedule on the loan or set an ending date when the recurrence will stop. Description – enter a reason for the fee.